One of my favorite spring vignettes is this cheerful one with pink flowers and green plants. 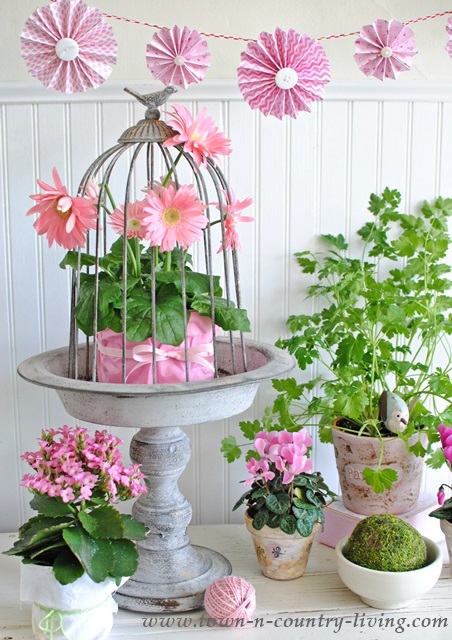 I tucked a pink gerbera daisy from the store inside my wire bird cloche. I pulled a couple flowers out between wires for added interest. 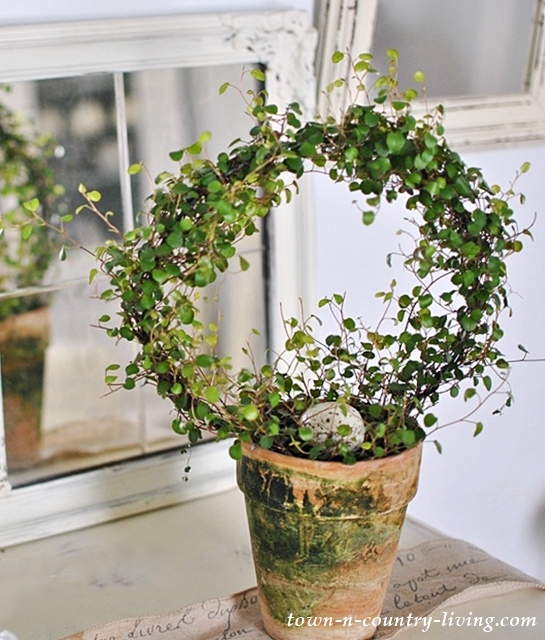 A fun way to dress up ordinary house plants with button flowers you can make yourself! 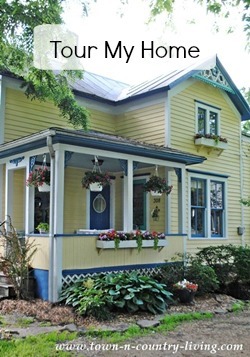 This is such an easy project, even kids can do it! I found a packet of colorful button flowers for just one dollar, so it’s economical, too. A topiary is always a nice addition to the home. It provides both greenery and a bit of architecture. 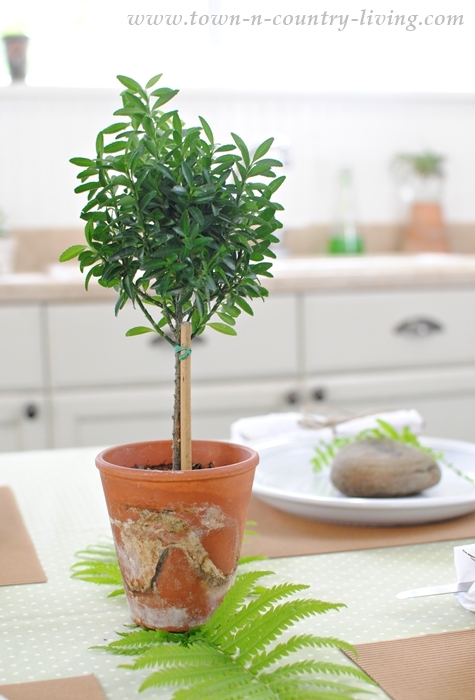 If you purchase plants like this from a greenhouse, they often come in crusty, mossy pots. There’s more humidity in the greenhouse so the moss grows naturally on the damp, terra cotta pot. Eventually the moss dries (unless you continually mist it), creating an interesting pattern and texture on the garden pot. I like to find creative garden pots or planters. 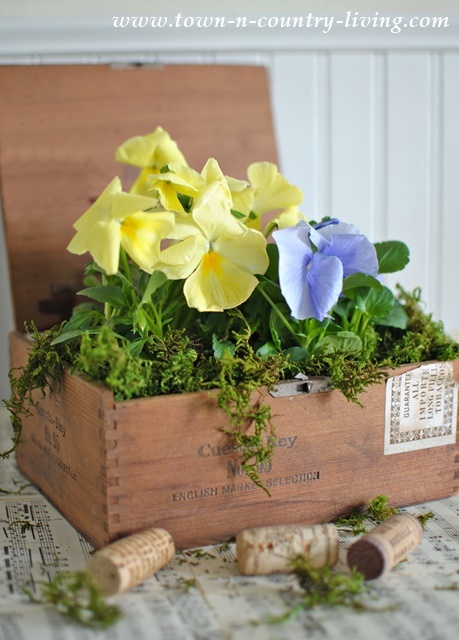 Here, I used cigar boxes for planters. A little prep work is all it takes to make them plant-ready. I buy my cigar boxes from Binny’s Beverage Depot for just one dollar each. You can also find them at flea markets, but you’ll like pay a higher price. 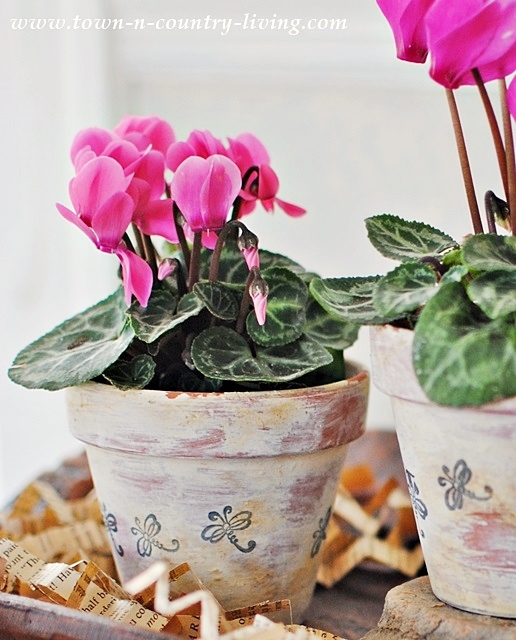 Terra cotta garden pots are inexpensive and easy to alter. I gave these a coat of white-wash and stamped them with bug ink stamps. I planted them with pretty pink cyclamen. 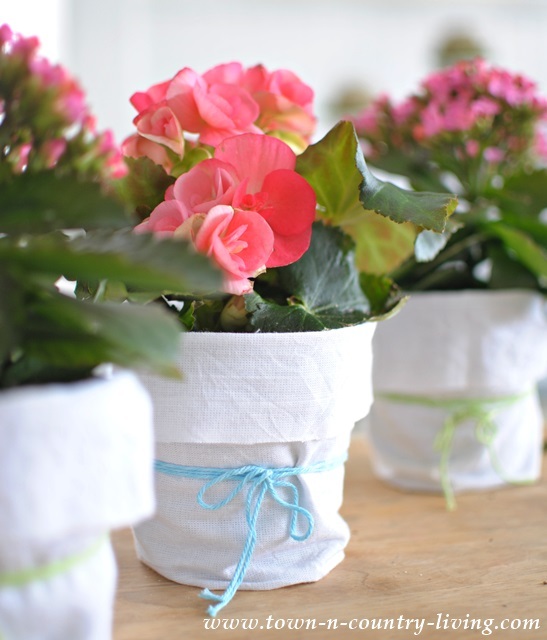 To hide plastic pots from the grocery store, simply wrap them with a cut-up kitchen towel and tie in place with a bow. You now have shabby chic garden pots. And finally, here’s a fun project to try. 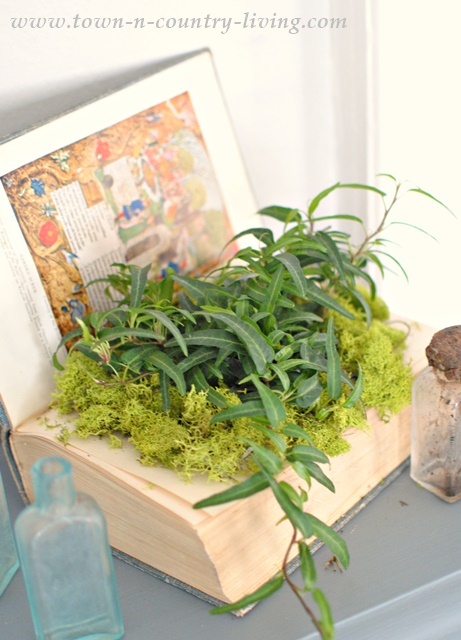 Create a planter from an old book. 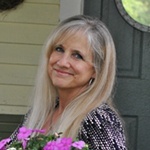 Pick up an inexpensive book from the thrift store and follow my instructions to prep it for planting. 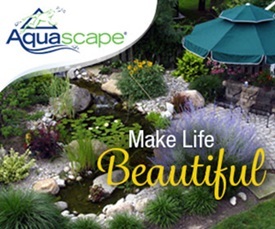 What creative planters do you like to use in your home? So many cute ideas! Getting very eager for spring. I was looking at nursery websites this morning so this post has me really motivated. I might have to order something online. Also, I really like your topiary idea. I might try one this year. Thanks for sharing. 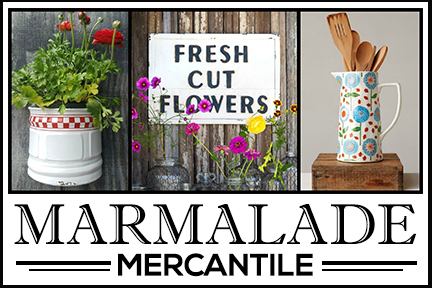 Oh, I love the terra cotta pots with the whitewash and bug stamps – great idea! I pinned this for some new ideas. I use bowls, candle hokders, all sorts of things for plants! I love each and every idea you showed us. I recently bought several tiny succulents from Lowes garden center, and kept them in their plastic pots. Then I put them down in antique silver sugar bowls I had collected over the years. I finished them off with a bit of Sphagnum moss around the edge to hide the pots, and they sit happily in my dining room window where they get morning sun, and filtered light all day. 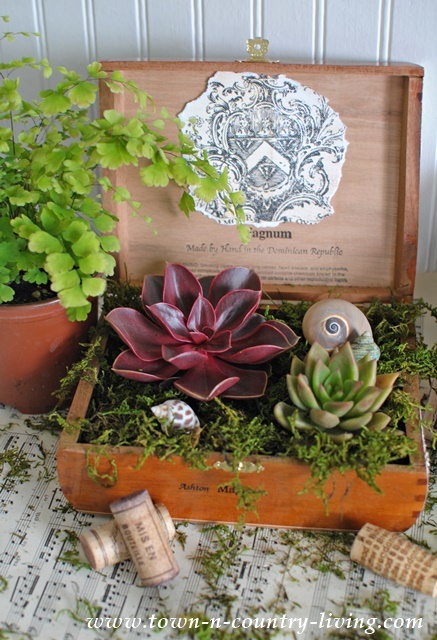 They are thriving in their new home, and the vintage look of the containers is a fun contrast to the “modern” look of the succulents. If I want to move them to complete a little vignette for a short time, they don’t seem to mind. Easiest plants I’ve ever had! Thanks for all the inspiration! Wouldn’t that book planter be cute for a book club door prize?